Australia can lay claim to a priceless psychological victory ahead of their eagerly-anticipated clash with the British & Irish Lions next summer - and it is one that may spell trouble for the elite tourists. A bruised and battered Wallabies side embarked on their end of year tour buoyed by a second place finish in the Rugby Championship and a hard-earned draw with all-conquering All Blacks but stripped of the services of several key players such as scrum-half Will Genia, flanker David Pocock, lock James Horwill, utility back James O'Connor and fly-half Quade Cooper they appeared to be there for the taking - a belief hammered home by a rampant France in Paris. England and Wales will have sensed blood in the water and an opportunity not only claim a rare win over their southern hemisphere rivals but also boost their world ranking ahead of the 2015 Rugby World Cup pool draw. Unfortunately it did not got to plan for the Home Nations with the Wallabies battling past England before stunning Wales with a late smash-and-grab in their tour finale. Straight-talking Lions boss Warren Gatland admitted that a victory would provide a timely boost ahead of Wales' final outing of the year rather than play down the significance of the clash and his side's subsequent failure is magnified as a result. Instead of sowing a seed of doubt in the supposedly 'wobbly' Wallabies' minds with commanding victories, both sides came up some way short in terms of performance despite the odds being seemingly stacked in their favour. Individuals largely failed to lay down impressive markers at the feet of their Australian rivals to further fuel the Wallabies' growing belief and confidence. The home sides' shortcomings hogged the headlines on both occasions but credit must go to the visitors for not only surviving but thriving in adversity. And it is they who will have caused concern with their tireless work rate, resilience and never-say-die attitude serving as a reminder, as if Gatland didn't know already, that his side face an uphill struggle Down Under. Much praise must go to Wallabies coach Robbie Deans. Written off by many during a trying year that also included a shock defeat to Scotland back in June, he was labelled the 'worst thing to have ever happened to Australian rugby' by former Wallabies winger David Campese. That assessment, like many from the lips or Twitter account of Campo, appeared a little wide of the mark at the time and even more so now. Deans has galvanised a squad that looked close to imploding, having been labelled as "toxic" by frustrated playmaker Cooper, and while they may not have produced the champagne rugby often associated with the Wallabies and concerns about a lack of tries may persist, you cannot question their commitment to the jersey or the coach. A side struggling for inspiration from team management would not dig as deep as they did in their victories at Twickenham and the Millennium Stadium. The Wallabies boss also appears to have the number of his coaching rival and fellow Kiwi. No coaches will have squared off in a Lions series so well accustomed to each other. Gatland has claimed just one victory in the nine matches between their two sides - with a puzzling six of those games having come in the last year. 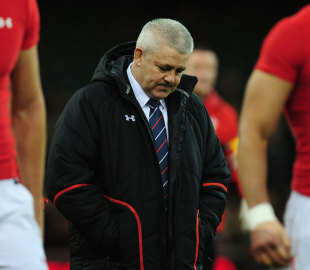 With such a fruitless record, Gatland will have been painfully aware of the need to snap that losing run - for his own sanity and the morale of his side. "Two wins from ten games against supposedly bar-setting Rugby Championship opposition is a far from desirable return for a Home Nations contingent looking to send out a warning." Ireland may have produced an eye-catching display to despatch Argentina and England may have burst the All Blacks' bubble to devastating effect during which individual players will have furthered their tour chances, but a lack of consistency across the board leaves a lot to be desired ahead of the Six Nations - a competition that most people accept does not reach the intensity offered by the Rugby Championship. Perhaps most alarming was Wales' apparent inability to learn from their failure to close the deal against the Wallabies in their summer series and claim a victory that their performance deserved. That fact highlights a possible mental fragility that the Wallabies are sure to play on. Two wins from ten games against supposedly bar-setting Rugby Championship opposition is a far from desirable return for a Home Nations contingent looking to send out a warning. There are so many questions for Gatland following an autumn series that was supposed to provide many answers. Flat performances and injuries will have decimated the provisional squad he drew up ahead of the international window and the Wallabies are sure to glean infinitely more from their gutsy end of year showing than Gatland will be able to from a worryingly few notable performances. Gatland will not only have to breathe belief into his players but also his coaching team that he is set to confirm later this month. Gatland is widely expected to plunder his Wales support staff for defence coach Shaun Edwards with assistant coach Rob Howley another in line for a return to the Lions. And if so, both will need to be re-energised ahead of their next meeting with the Wallabies after a mental and physical battering in recent weeks. England emerged with most credit from the autumn and that is sure to be reflected in another Lions tour for assistant coach Graham Rowntree while fellow assistant Andy Farrell now also looks a prime contender having already been linked with a role. The Lions were already guaranteed to be up against it with an intense domestic season and brutal Six Nations sure to take its toll in terms of injuries in the coming months and an insane schedule - that will see the Premiership and PRO12 finals take place just a week before the first tour game - limiting the preparation time available to Gatland to blend his squad and conjure the all-important team spirit. That task would so much easier with at least on victory fresh in the mind. Australia would have ventured on their end of year tour with some trepidation but will return rightfully bullish. Having survived a stern test of their credentials they have little to fear ahead of next year against a Lions side that is yet to show its teeth.